I have been fascinated by Lynette Meek's painted knitting. 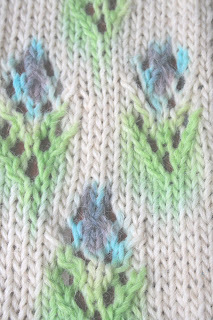 The link is to her blog where she posts lots of information and by the way, she has a booklet out now on how to paint your knitting. I decided that I had to try some painted knitting, since I have a very nice chunky alpacalicious yarn, which I know takes Kool Aid dyes very well. I chose a very simple flower pattern in eyelet lace, quickly knit both sides of the scarf and then grafted the two sides together - not so quickly, because I was in a hurry, by then, to get painting and of course made mistakes, which slowed me down!! I had already bought several packets of Kool Aid in the colours (flavours) that I wanted to use, I just had to find a paint brush and I was ready. I borrowed a paint brush from the 18-year-old - I secretly think that it was really my brush, which he had borrowed and claimed was his - Oh well. Now to mix the dyes. I used 3 egg cups and put about 2-3 tablespoons of warm water in each. I then emptied half the crystals from Ice Blue, Lemon Lime and Grape into the cups. I gave them a quick stir and headed outside where my scarf, which I had just soaked in luke warm water, was waiting to be painted. 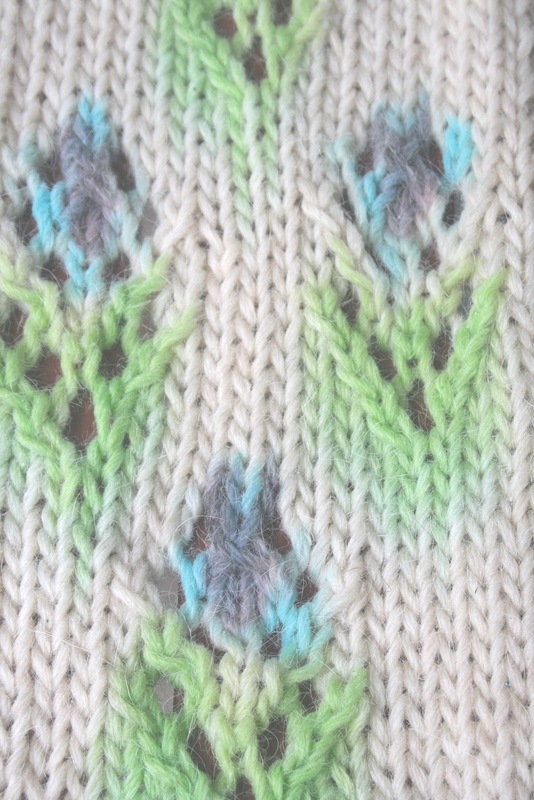 I wanted a provincial print effect - I know it's chunky yarn, who am I kidding? Anyway, I painted the leaves of the lace stitch green, the centre of the flower grape (purple) and the outside of the flower blue. The colour runs a little, which creates a water colour look and dilutes the dye a little - an effect I like and I know that I can't change this. I just have to work with it. At first I let the scarf hang over the edge of the table as I painted; but the dyes ran a little too much so I decided to work the other colours with the scarf flat on the table. I folded the scarf in half and then in half again over an old tea towel so that the flowers wouldn't touch each other and popped the garment in a bowl which I popped in the microwave. Two sessions of re-heat (6mins) and the dyes were set. When I rinsed the scarf in luke warm water, no colour came out, so I hung it on a railing to dry. This was just so fast and so easy and so much fun!!! Now to try some finer yarn and maybe rayon. Fascinating! Something else on my "one day must try" list.